# Enable your laptop to use advanced ExpressCard 34mm device. # Compliant with ExpressCard Specification 1.0. # Compliant with ExpressCard/34mm standard. # Compliant with PC Card standard release 8.0 specification. # Supports 16-bit PCMCIA 2.1/JEIDA 4.2 and 32-bit CardBus. # Supports data transfer rate up to 480Mbps. # One end is USB-mode (not PCI-E mode) ExpressCard 34mm male connector. 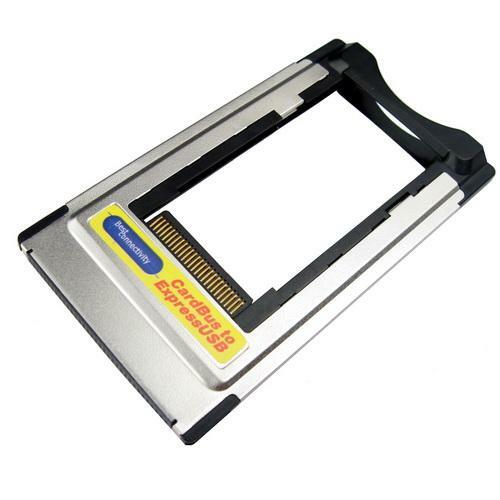 # One end is PCMCIA type II interface, which is compatible with PCMCIA type II/III slot. # Plug & play and hot swapping capability. # Easy install & no driver required. # Self-powered mode, no external power required. # Compatible with Windows 98/SE/ME/2000/2003/XP/Vista/7, Mac OS 8.6 or higher & Linux. # Dimension: 95x55mm. # Net weight: 21g.